On October 23rd, we’re going to host the 2nd edition of our EU-Startups Conference! The anual event where we showcase a selection of Europe’s hottest startups and where we come together to learn from some of the most successful European entrepreneurs of our time. The event will take place between 2pm and 7.30pm in the awesome event space “Cathedral” of the Rainmaking Loft Berlin. Run by entrepreneurs and angel investors, the Rainmaking Loft Berlin is an international startup hub with a vibrant co-working and event space. 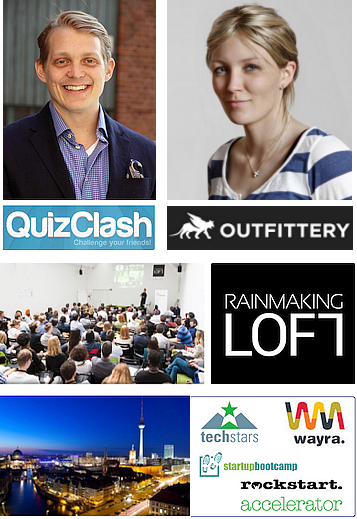 At this year’s EU-Startups Conference at the Rainmaking Loft, we’re expecting around 140 attendees. The EU-Startups Conference, which will be held in English, will be the perfect event for startups and investors that are aiming to enter multiple European markets or global markets from within Europe. We will have fireside chats with two internationally successful founders out of the Internet space and an exciting pitch competition with 15 startup teams. Anna Alex – the Founder and Managing Director of Outfittery, a curated shopping service for men’s clothing, which was founded in 2012. Outfittery revolutionizes the shopping experience for men. Headquartered in Berlin, Outfittery operates in 8 European countries and employs over 200 people. Outfittery is one of Europe’s most promising online fashion companies right now. So far, the two founders Anna Alex and Julia Bösch were able to secure over €30 million in venture capital. Robert Willstedt – the Founder and CEO of FEO Media, the company behind the mega success QuizClash. The social quiz game, available in 21 different country specific versions, reaches 50 million users and counting. Due to the global success of QuizClash, it has been adapted into alternative platforms like books, board games and a TV game show. Currently, the Stockholm-based team behind FEO Media is hard at work on several new and exciting titles. The current attendee list can be found here. If we already got your attention and you’re able to be in Berlin at that time, we highly recommend you to purchase your ticket now! During our event, we’ll have a panel discussion with leading European startup accelerators like Wayra, Startupbootcamp, Techstars and Rockstart Accelerator. After an introduction of each participating accelerator and their strengths, we’re going to talk about topics like “how to find the right accelerator for your startup”, “how did the accelerator landscape evolve”, (etc.). During the EU-Startups Conference, we’ll also have a huge pitch competition with 15 of Europe’s most exciting startups. Participating startups are going to pitch their business idea within a 3-minute-presentation in front of the audience and an expert jury of well known investors. The winner will receive an awesome price package worth €2.500. More info about the pitch competition can be found here! We kept it affordable: The two ticket categories we’re offering (€29 / €59) already include food and drinks during our networking break. Tickets can be purchased here! Amazon Web Services provides startups with an affordable, easy to use infrastructure needed to scale and grow any size business. Some of the world’s hottest startups including Pinterest, Instagram, and Dropbox have leveraged the power of AWS to easily get started and quickly scale. AWS Activate is a program designed to provide startups with the resources needed to get started on AWS. Join some of the fastest-growing startups in the world and build your business using AWS. Hiscox is a leading specialist insurer and offers tailored insurance cover for sole traders, freelancers or contractors, as well as small business owners. A FTSE 250 company, Hiscox provides market-leading products, such as professional indemnity for the specific business needs in IT, marketing and advertising, recruitment and management consultancy, which all can be easily bought online. Often, self-employed freelancer and startups are not sure what kind of risks they might face, and what cover they need. Hiscox does its best to explain what the different insurance policies can cover and provides excellent service to its clients.